While obesity may cause someone to have trouble climbing stairs or fitting into the latest fashions, the most serious problems it causes are the associated health risks and the challenges the medical community faces when offering treatment. For example, when a patient has excess weight in their upper arms, physicians and nurses in many cases have to utilize special equipment and techniques to insert an IV. 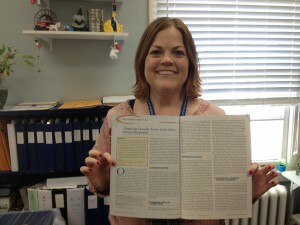 Patricia A. Houston, RN, MPH, M.Ed., Coordinator of the Bariatric Program at Beebe Medical Center, has published a professional article in the January/February 2013 issue of the peer-reviewed Journal of Infusion Nursing on this aspect of care of the obese patient. Her article, “Obtaining Vascular Access in the Obese Patient Population,” compiles the research that has been done on safe and effective techniques when using IVs on obese patients. Houston, a registered nurse with masters’ degrees in education and in public health, became interested in the subject in 2010 after taking over the coordinator’s role for Beebe’s Bariatric program, which offers a comprehensive approach to weight loss that includes surgery, nutrition counseling, support groups, and exercise. Beebe Medical Center’s Bariatric program has been designated at Bariatric Surgery Center of Excellence by The American Society of Metabolic and Bariatric Surgery. Houston is an associate member of the organization. The several techniques Houston discusses in her article include: using ultrasound to find the vein; using longer IV devices; angling the needle differently; and measuring the arm to allow for the extra tissue in cases of obtaining peripherally inserted central lines. “Research shows that using these specialized techniques leads to fewer needle sticks, faster time starting the IV, a reduced risk of infection, and improved patient satisfaction,” she said, pointing out that anesthesiologists and vascular access team members already use these techniques at Beebe. For example, anesthesiologists can bring a portable ultrasound machine to the patient’s bedside when inserting an IV. Houston presented her research in November 2011 at the Infusion Nurses Society’s National Academy of Infusion Therapy in Los Angeles, CA. Paul Minnick, RN, MSN, NEA-BC, Executive Vice President/ Chief Operating Officer of Beebe Medical Center, said that Houston’s research reflects her commitment to patient safety and to quality care. The Journal of Infusion Nursing is the official publication of the Infusion Nurses Society and promotes excellence in infusion nursing by presenting new research, clinical reviews, case studies, and professional development information relevant to the practice of infusion therapy. Articles selected for publication represent the broad scope of the infusion specialty and draw on the expertise of all health care providers who participate in the delivery of infusion therapy. The Society has about 7,050 members, all of whom receive the Journal as a member benefit. The magazine also has about 500 nonmember subscribers. Readers include infusion nurses, pharmacists, entrepreneurs, academics, nurses in other specialties, and physicians.